Four cylinder two wheel drive manual. Just replaced the timing chain but not sure how to reset the timing to the proper specs. The timing looks to be set right. The truck still will not start could the distributor be 180 degrees out? The truck still is turning over really slow and there is a little tapping noise but when you move the distributor cap the noise stops. Could a bad distributor cause that? 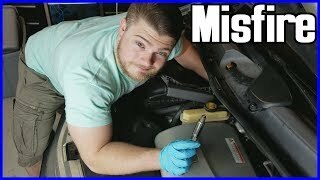 Crankshaft sensor may be at fault instead of the distributor. Will an engine out of a 1994 Nissan truck work in a 1997 Nissan truck? The 1990 to 1997 Nissan Hard-body truck used the same engine, the 2.4L SOHC twelve-valve. Replaced timing chain and sprockets. Thought we aligned it correctly. Now it runs but timing is way advanced. Cannot adjust less then twenty degrees btdc. Was running good before we changed out the timing chain. We were trying to do preventative maintenance. Even though you had the marks set, they may have moved when you tension-ed the chain with the tension-er. Re-check the marks. Just verified that the marks are set and that they did not move. The truck seems to run good, but my timing is still at twenty btdc. Can I let it go like this? Twenty is not too bad for idle timing. Going to check the spec. I have just replaced the timing chain, both cam and crank gears, and rear oxygen sensor. Erased the check engine light, now no lights are on. I had the number one piston up and I set it on TDC. The way the book shows me is the first marking is negative 5, 0, 5, 10, 15, 20. I aligned it at the zero marking. Now when I start the truck it does not want to idle, have played around with the distributor, advancing and retarding the timing, cannot get it to idle. When I give it some throttle it wants to run better, seems like it is flooding out. Can you help me? Thank you. What code? What kind of truck? What engine? Four cylinder two wheel drive manual 240,000 miles. I just bought this pickup and it runs great. I do not think the timing belt has ever been changed. Should I change it even if it runs like a dream? Change the belt as a matter of coarse, if it fails and it will not give any warning you will at best be stranded and at worst do serious damage. I am not sure which engine you have so I do not know if it is interference or not, this goes for any belt driven engine. If you do not know the exact history replace the belt. Had to take the timing chain out, it had broken the timing adjuster and rubbed a hole in the timing cover where the water jacket was, letting water in the oil. So it had already jumped time. So I changed everything and bought new parts. Need to know how to time it back. Your help would be greatly appreciated. 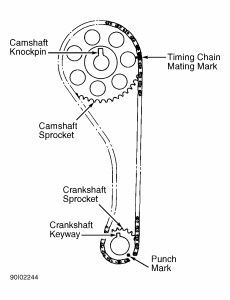 Here are the camshaft timing marks. Check out the diagrams (below). Please let us know if you need anything else to get the problem fixed. How Do You Know If You Need A Motor Mount.